40 Shillings on the Drum are joining forces with Brighton & Hove Impetus for their 'Connect 4 Loneliness' campaign between October and December 2017. Tomorrow night (17/11/17), 40 Shillings on the Drum will be taking to the stage for their biggest show to date at The Prince Albert in Brighton. The band will be recording a live album, for release in January 2018, just prior to their UK tour, and would love you to be a part of it. It is also the first of two shows that the band will be performing at to raise awareness and funds for the Brighton & Hove Impetus charity. Doors are 8pm and entry is only a fiver, with a percentage of all sales being donated to Impetus. Come down and kick start your weekend with a night to remember! 'The English Coast', from the EP 'Beggars Who Believe', will be released as a standalone single this Friday 20th October and available through iTunes, Google Play, Amazon, and many other online retailers. 40% of all sales will go directly to Brighton & Hove Impetus. 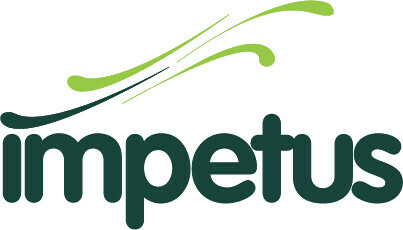 Impetus is the multi-award winning Brighton and Hove charity connecting people to reduce isolation and improve wellbeing. They deliver a range of community services for adults across the city. Working closely in partnership with many other voluntary sector organisations, the users of their services include people with learning disabilities, people with mental health issues, older people, people with physical disabilities and people with autistic spectrum conditions. Brighton & Hove Impetus have chosen 40 Shillings on the Drum's video for 'The English Coast' to front their 'Connect 4 Loneliness' campaign between October and December 2017. I wrote ‘The English Coast in early 2016, before 40 Shillings on the Drum had publicly launched. I’ve always been an admirer of England’s countryside and coastline; growing up by the sea, I would often walk along the clifftops as a teenager, listening to my favourite albums as an escape from the tough times of secondary school. Like many youngsters, I suffered from bullying throughout my time at school, but the first few months of secondary school were the toughest. I didn’t have any friends and used to go to the library just so that I could be alone without being picked on. Although I was fortunate enough that a group of boys from my class befriended me one lunch time, I’ll never forget those early months and how they made me feel alone, even at that young age. I wanted to write a song that captured my feelings about the beauty of England and how sometimes, a little time out from day to day life to think and look forward, can improve your disposition. I wrote the bulk of the lyrics and vocal lines in an afternoon, and sent over a recording for Seb Cole, my keyboard player, who I was forming a strong, songwriting bond with. He put the initial music behind it, we made a few tweaks and I wrote a chorus section, and then we took it to the band to finish it off. 2017 rolled in and as well as my songwriting bond growing ever stronger with Seb, the band as a whole were getting closer as a unit, and as friends. That’s around the time when our guitarist, Steve, opened up to me about his history with health problems and depression. Music can be a powerful thing, and whilst I was sad to learn of the struggles he had faced in his teens, when he spoke of how the guitar had brought him out from such a dark place, I thought it was incredible. I had much admiration for the strength it must have taken to overcome his problems. I knew I wanted ‘The English Coast’ to be the closing track for our debut EP, ‘Beggars Who Believe’, but being an uplifting song about escape and positivity, and now knowing of Steve’s own struggles over the years, I wanted it to be more than that. That’s when I decided that the song should have a video of its own and that we should try and capture something heartwarming. The basic premise for the video just popped into my head. People are beautiful when they smile, and I wanted to capture that moment - the moment when something makes a smile break out on a person. The idea naturally developed, and before long the band were seeking out volunteers from different walks of life to be a part of it. The location of Castle Hill in Newhaven was perfect to film the video both because it is referenced in the song, and because it has stunning views of the English Channel. On 2nd July 2017, we took forty volunteers up to the filming location. The sun was shining for us and we captured some wonderful footage which I then edited together for the music video. I’m over the moon that Brighton and Hove Impetus are working with my band for their ‘Connect4Lonliness’ campaign. It was my intention to create a special music video that could be enjoyed by many over the coming months and years, and to have such an important and multi-award winning charity want to use it to spread their ethos of reducing isolation and improving well-being is amazing! I hope the song and it’s message gets to reach more and more people, and makes them smile too. 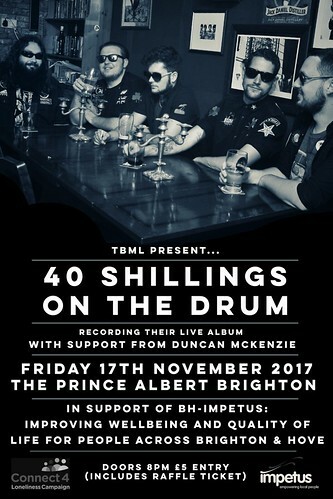 On Friday 17th November 2017, 40 Shillings on the Drum shall be taking to the stage at The Prince Albert in Brighton to record a live album. The show will also be in support of BHimpetus and their 'Connect 4 Loneliness' campaign, and the charity will be giving a short talk about the work they do in the Brighton area, what their current campaign is about, and how you can help. Support on the night will be from Duncan Mckenzie. Doors to the show are at 8pm. Tickets will be available on the door on a first-come, first served basis, and your £5 entry fee will double up as a raffle ticket, which will be drawn after 40 Shillings on the Drum's set.